This is Part 3 of 3 in a series on Low Volume fabric usage, not meant to be a comprehensive study, but a starting point. For Part 1 or Part 2, follow the links! Aren’t they just FUN?!? You still can see the effect the bow tie blocks have, but the background adds some major interest. Yes, the “I don’t have an inside voice” LV’s compete more with the prints, but it still works!! Once again, the key is pairing a print with majorly contrasting colors with the LV. It will not work otherwise. For instance, the flamingo block (top row, 2nd from the left) would be lost if it were a pink bow tie. Now the question some of you might be wondering: How do all 3 LV types work together? 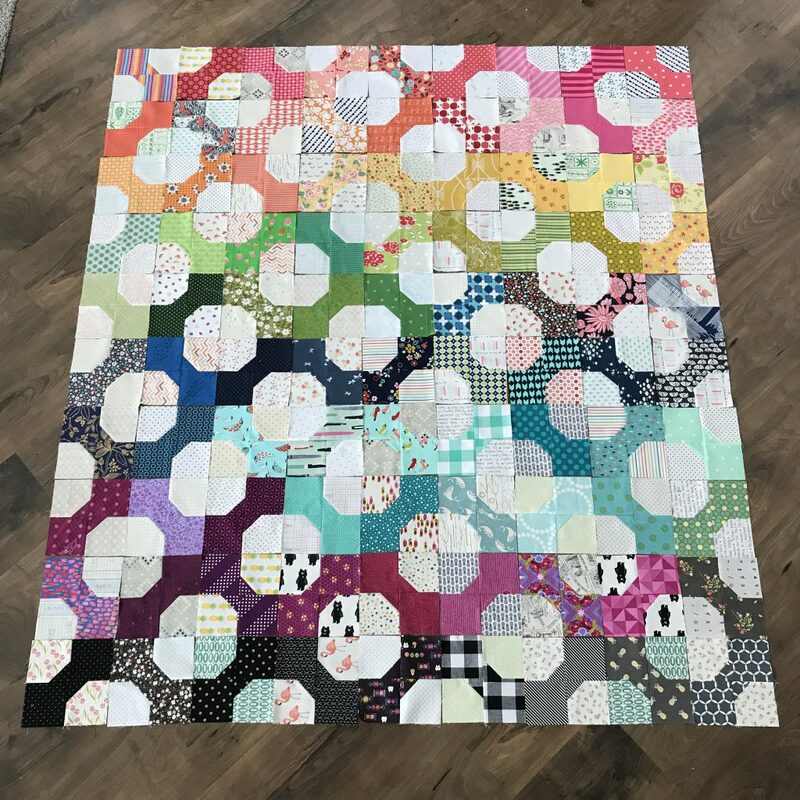 Well I’m happy to share my quilt thus far. It is one of my very favorites because of how unique it is. Isn’t it just funky and fun? My eyes are constantly moving looking at different prints and backgrounds. 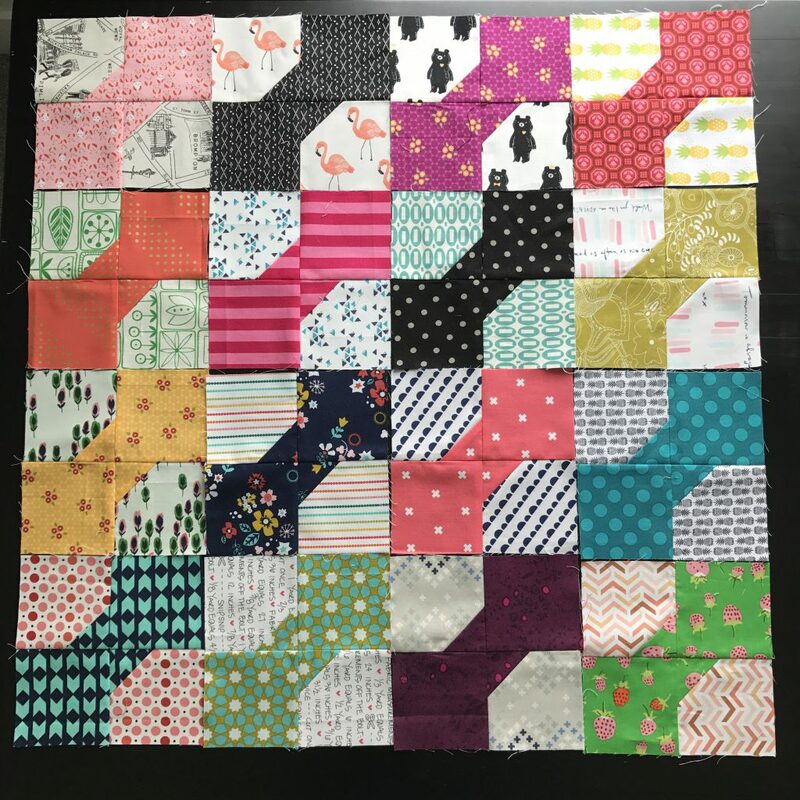 I won a bundle from the very lovely and generous Holly Lesue of Maker Valley that served as the inspiration for this quilt as well as all of the Long Time Gone sewalong photos I saw around the same time. There are SO many great uses of LV happening in the sewalong (check out the #longtimegonesal if you want some more inspiration!) 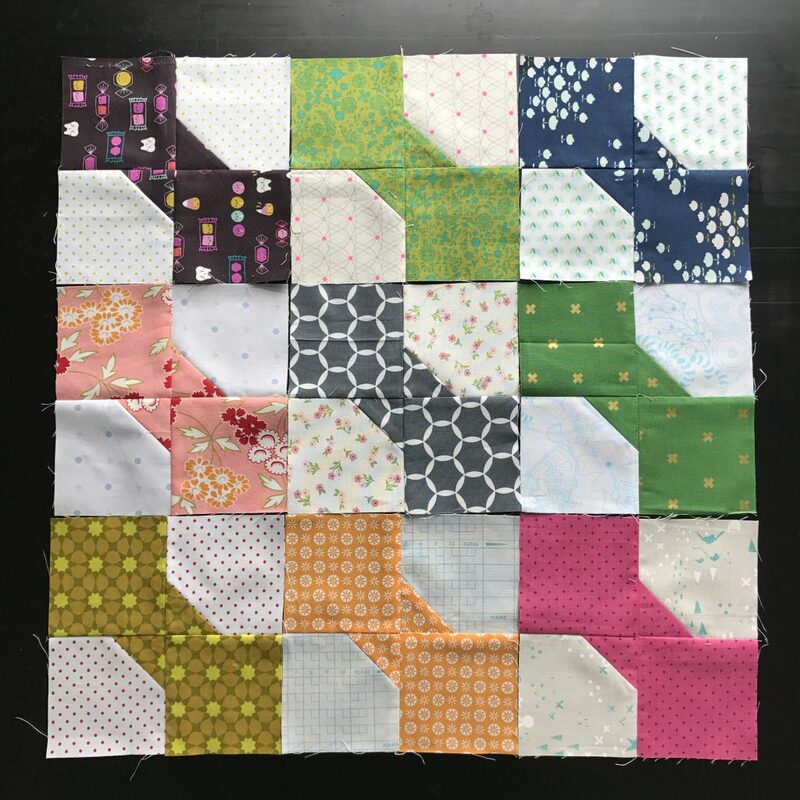 I chose this block for a bee I’m in and I cannot wait to get my blocks back this month and add them into the scrappy, happy goodness that already exists. What are your thoughts now? Are you a “whisper quiet”, a “normal voice”, or an “I don’t have an inside voice” type of LV quilter? Or maybe you like all 3? 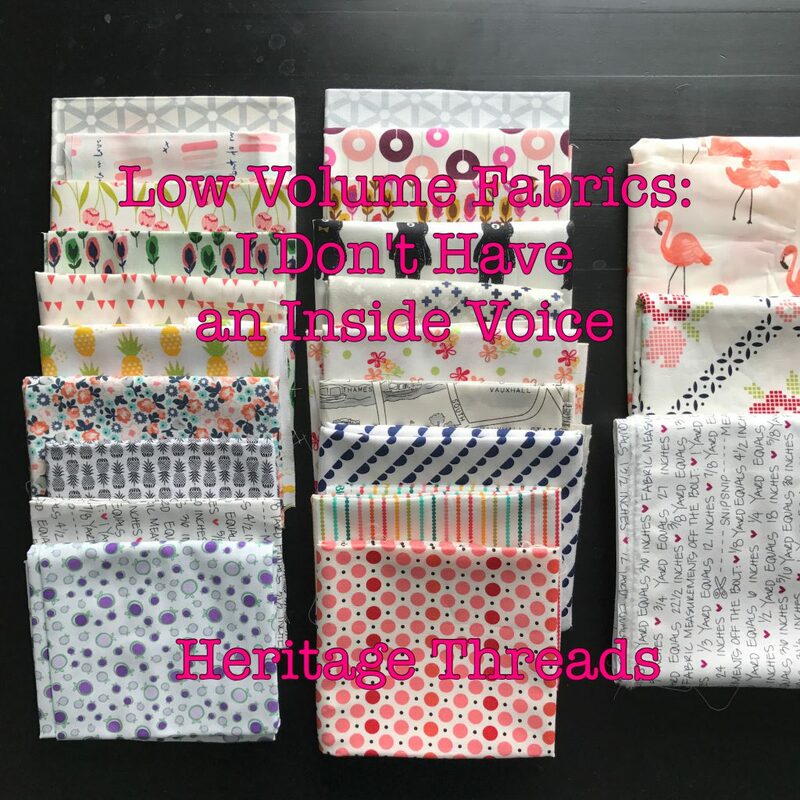 This is Part 2 of 3 in a series on Low Volume fabric usage, not meant to be a fully comprehensive study in low voumes, but a good starting point. For Part 1 or Part 3, follow the link! 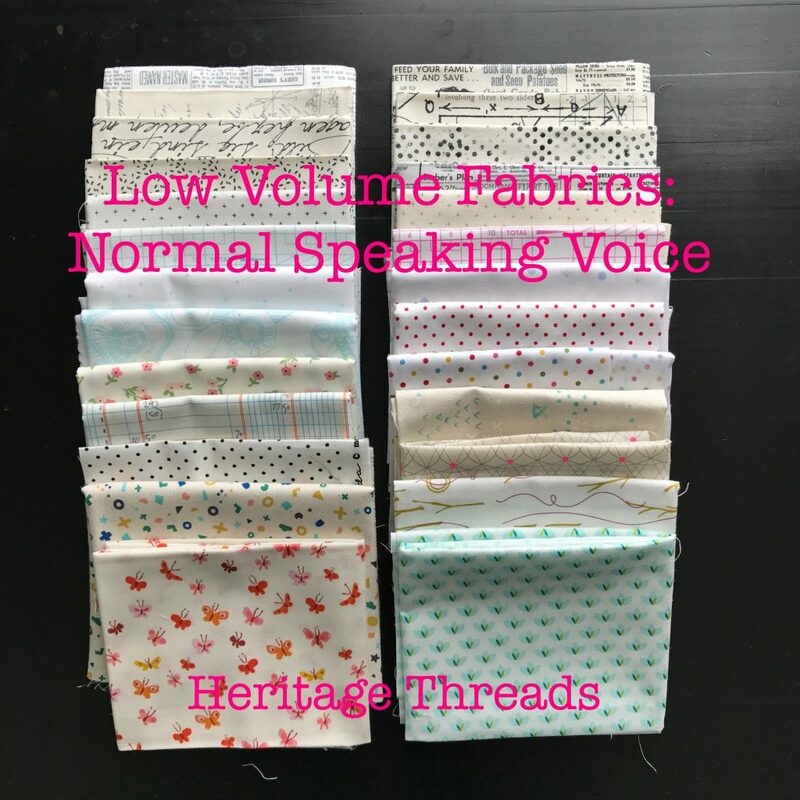 This lovely selection of low volume (LV) fabrics I like to call “normal speaking voice”. They have a white/cream background, but also have some more punch to them than the “whisper quiet” palette. These LV’s have more color and more pattern in them than the whisper quiets do, while still not being incredibly distracting AND still having a light base cloth of white/off-white/cream/super light gray. Here’s an example of “normal speaking voice” in action. When pairing these “normal speaking voice” LV’s with prints, make sure you pick a print that is contrasting in color from the color of the LV. If you were to pair a blue-ish LV with a similar blue print, you’d lose the effect of using a more colorful LV. I think that’s one of the bigger mistakes people make when using LV. 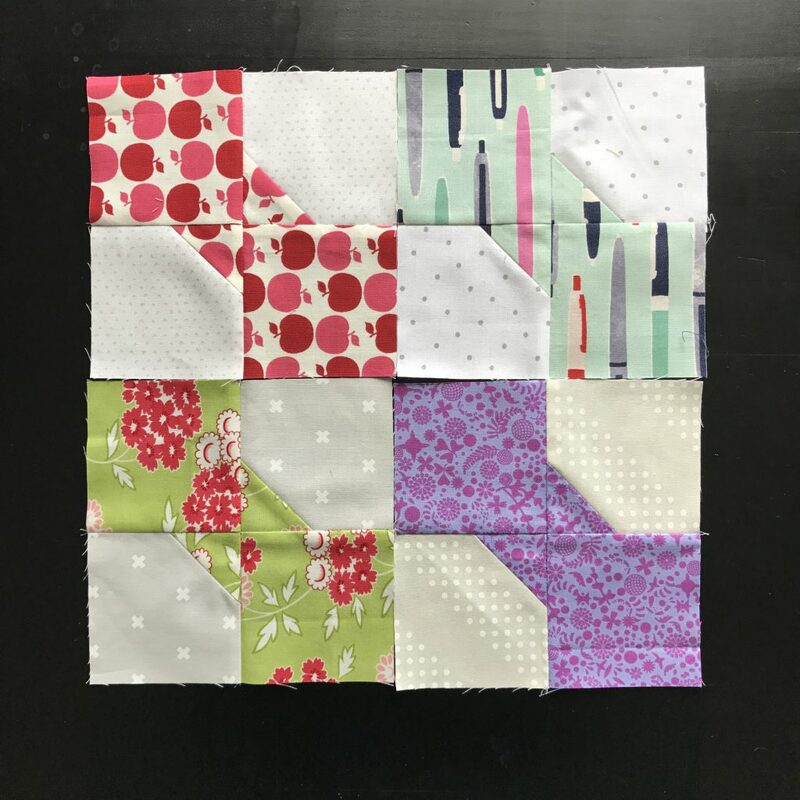 As I was making blocks for this quilt, I tried really, really hard to purposefully pair prints with LV’s that were not matchy-matchy and very contrasting. In fact, some blocks were so ugly (to me) I was sure they wouldn’t make the final cut. However, when the blocks are all set out together, the overall effect is very pleasing. What do you think so far? Are you a “whisper quiet” fan or a “normal speaking voice” fan? 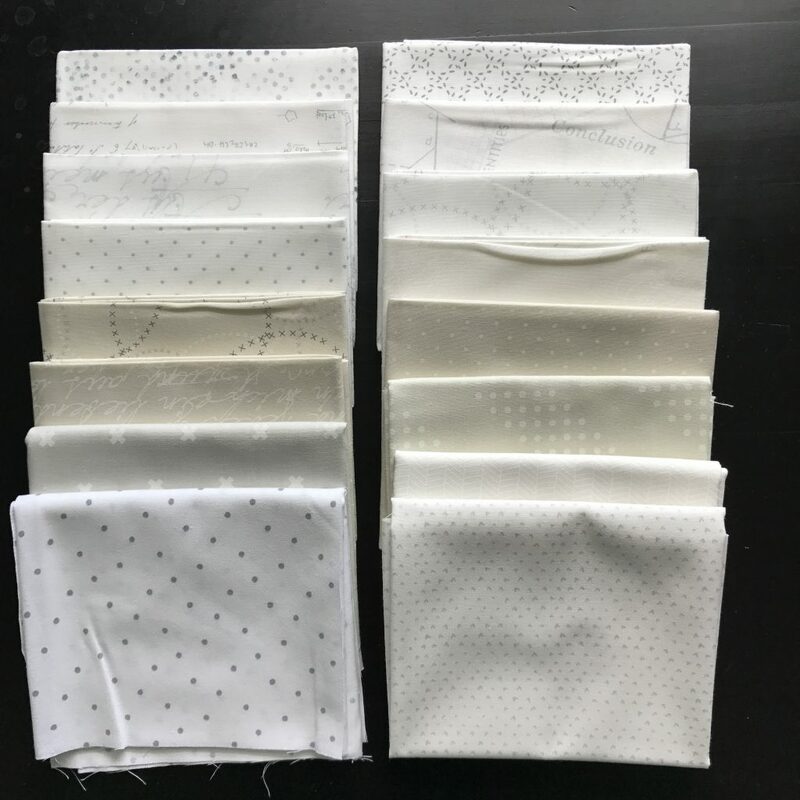 I’ve been tossing around the idea of posting my take on low volume fabrics and how I would categorize and use them for awhile. It seems like there is a lot of differing opinions on what is actually a low volume and what isn’t. I love this aspect of quilting!! We all have our thoughts and ideas and in the end we make beautiful things because of our differing gut instinct. I’m going to tackle these low volume thoughts in a 3-part series starting today! The first category of low volumes are what I’ve decided to call “whisper quiet”. 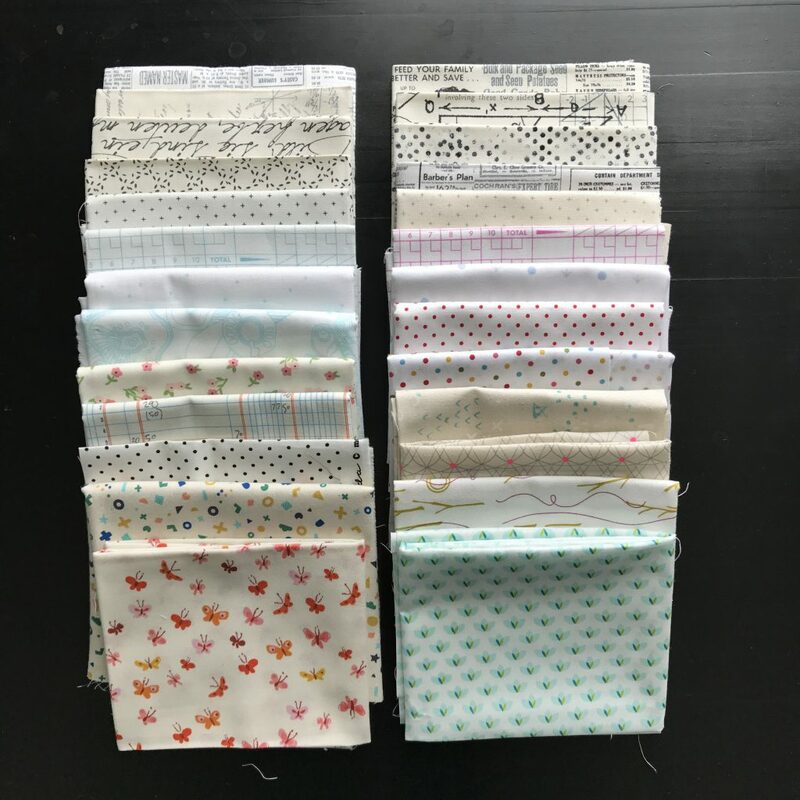 I pulled some examples from my stash and included a few sample quilt blocks made with “whisper quiet” low volumes. In essence these low volumes are as close to a white as possible. They look like they could be a white or very light solid when you look at them from afar and within a quilt. Most likely they are a white or an off-white background with white, gray, or light brown subtle prints. I’ve heard some quilters say they’re afraid to use low volumes because they don’t know how to pair prints with them in a way that the prints will pop. When you use “whisper quiet” low volumes, the sky is the limit with pairing it with prints. Since the background ends up being so light, you can get away with pastels, jewel tones, vibrant hues, subdued tones, etc. 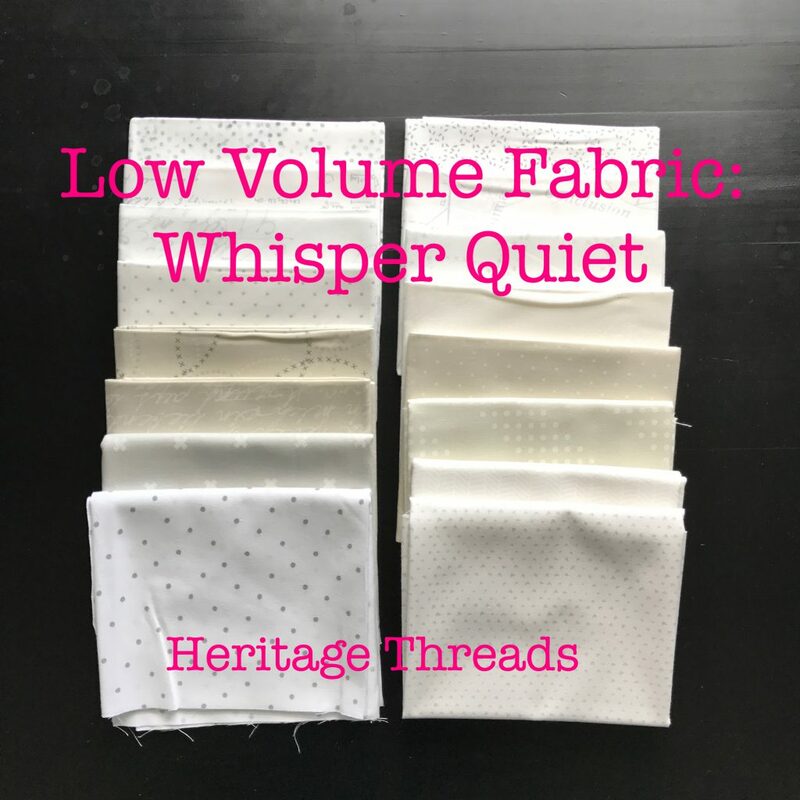 Essentially if you would love to make a low volume quilt, but you’re afraid of the end result, start with a whisper quiet color palate! !